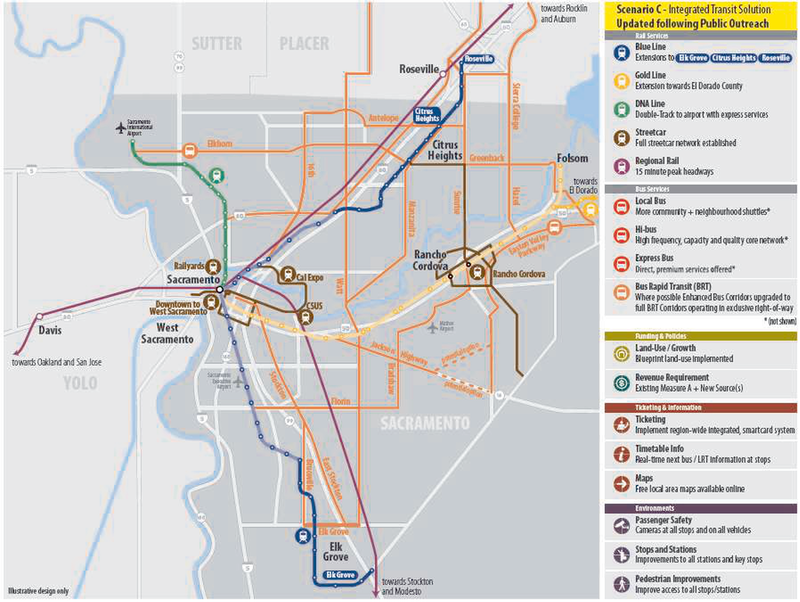 SacRT is considering a number of extensions to the light rail system, beyond the opening of the Blue Line extension from Meadowview station to Cosumnes River College, which will occur August 24. 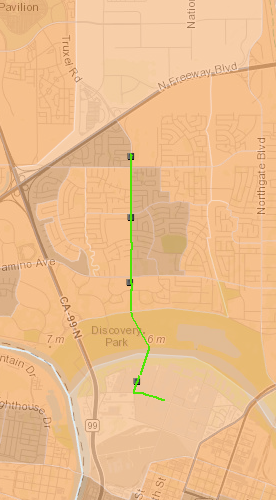 Green Line to the Airport, also known as DNA (Downtown, Natomas, Airport). This project is likely in two phases, first from the current end at Richards Blvd to somewhere in North Natomas, and second the rest of the way to the airport. Information on this project is on the SacRT website. This project is furthest along, and the draft EIS/EIR is now being prepared. 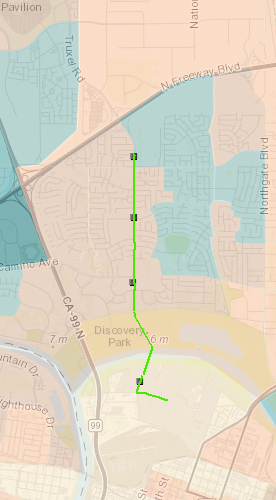 The map of the “locally preferred alternative” is at right, and this links to the larger map on the SacRT website. Blue Line to Elk Grove. This project has been talked about, particularly as the line to CRC has approached completion and generated discussions of whether or not Elk Grove residents will be willing to change from bus to light rail at CRC. So far as I know, there are no publicly available documents on this extension, but it is included in the 2009 Transit Action Plan updated Scenario C (below). Blue Line Northeast Corridor. This project would extend the line to the northeast, to American River College, Citrus Heights, or Roseville. Though this project was part of the original vision of the light rail line when constructed back in the 1970s, it has not received much notice while I’ve been in Sacramento. So far as I know, there are no publicly available documents on this extension, but it is included in the 2009 Transit Action Plan updated Scenario C (below). Each of these extensions are worth exploring in detail, but for now I’m posting because I have two ideas I want to share. The Green Line to Airport extension should be modified so that the next phase goes only to the San Juan station just south of Interstate 80. Potential extensions to North Natomas and the airport are questionable in my mind because the income and density levels in North Natomas provide a much weaker justification for the line, and I don’t think airport service will really generate much use and fare recovery. While every city wants light rail to the airport, of the ones already built, only some are successful, and many are not. The map below left show population levels overlaid with the extension to San Juan, while below right shows household income levels. For population density, the line would serve an area of low moderate (1-10K people per square mile) to high moderate (10-25K) density. For comparison, midtown, Arden-Arcade, and south Sacramento are low moderate to high moderate density. Density is important because it directly affects use and therefore fare recovery. For income, the line would serve moderate ($53-68K household income) and low moderate income ($39-53K) neighborhoods. For comparison, south Sacramento and Arden-Arcade are low to low moderate income. High income neighborhoods, which generally have lower use rates, lie to the north in North Natomas. I would suggest that this “phase 2A” extension be started immediately, for completion within five years. The second idea is that all other light rail extensions should be halted until a new vision is developed. Since the 2009 transit action plan, much of which is based on earlier work, much has changed in the citizen view of transit and the understanding of how to design efficient transit systems, both locally and internationally. A line running through low density areas, whether low density suburban/exurban areas such as North Natomas, or agricultural areas such as the northern part of the route to the airport, are harder to justify in terms of service, fare recovery, or economic vitality. While it is possible to bring riders to the line by building transit-oriented development (TOD) along the lines, the region has just started into exploring these projects, with the only one so far being Alkalai Flat/La Valentina. Others are being talked about but far from construction. Of course the redevelopment/infill occurring in midtown and downtown are to some degree TOD, but they were not implemented from a view to developing TOD, but because the developer thought the location made economic sense. In some locations, the transit agency actually controls land around stations, and cannot only control but benefit financially from TOD. Sacramento is not one of those place, at least not yet. So, what I’m suggesting is the all the extensions be re-evaluated to determine which ones make sense, and then to prioritize them based on populations density, income, ridership, and economic development. Light rail to Roseville! Thanks for the summary. Wouldn’t increased service on the existing train from Roseville to Sac serve the same purpose? An it’s already there. Yes, increased Capitol Corridor service would serve Roseville, but doesn’t do anything for ARC and Citrus Heights. Increasing service on Capitol Corridor requires the third track, for which planning is underway, but funding and construction are years away. But then, so would construction of light rail be. I’m not suggesting that light rail to Roseville is the solution, just that it should be considered. Capitol Corridor will never reach the frequency of light rail, and it is a more expensive service (unless of course RT implements distance-based fares, which they should). There is clearly a market for increased Capitol Corridor service for Roseville, and I support that.